A Workshop/Performance with Joe Deninzon and Your Students’ String Orchestra. Your students can experience the same creative growth and empowered energy that string students all over the world have felt from violinist/composer/Joe Deninzon. Joe will workshop arrangements of rock and jazz-rock -based compositions with your students, and perform with them. In a rapidly changing musical landscape, strings have found their way into almost every style of music in recent years. In addition to classical, country, and folk genres, we hear strings everywhere from rock, metal, pop, and jazz, to hip-hop, electronic music, and funk. With orchestral jobs in short supply, today’s string player needs to be more versatile than ever in order to survive and thrive as a working musician. A good foundation of technique and classical training should be supplemented by an ability to improvise and be familiar with a vast repertoire of music outside of the classical realm. Composition skills, as well as a familiarity with technology are also crucial. please email info@joedeninzon.com or contact Anne Leighton (leightonmedia@aol.com or 718-881-8183). 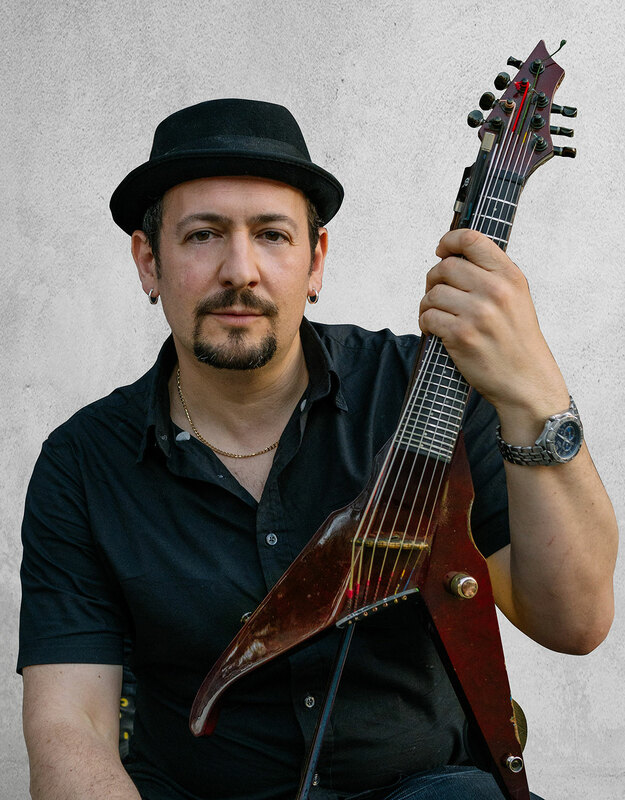 Joe Deninzon has been hailed by critics as “The Jimi Hendrix of the Violin,” because of his innovative style on electric seven-string violin. Joe has worked with Sheryl Crow, Bruce Springsteen, Phoebe Snow, Everclear, Ritchie Blackmore,, Smokey Robinson, Aretha Franklin, Robert Bonfiglio, Les Paul, and as a soloist with the NY City Ballet and Jazz at Lincoln Center. Joe is the lead singer and violinist for the progressive rock band, Stratospheerius, which has released five acclaimed CD’s. He can be heard on over a hundred CD’s and jingles as a violinist and string arranger. A BMI Jazz Composer’s grant recipient and winner of the John Lennon Songwriting Contest, he has written a solo piece for violinist Rachel Barton Pine, which will be featured on her upcoming CD. In 2015, Joe premiered his “Concerto for Seven String Electric Violin and Orchestra” with the Muncie Symphony Orchestra.